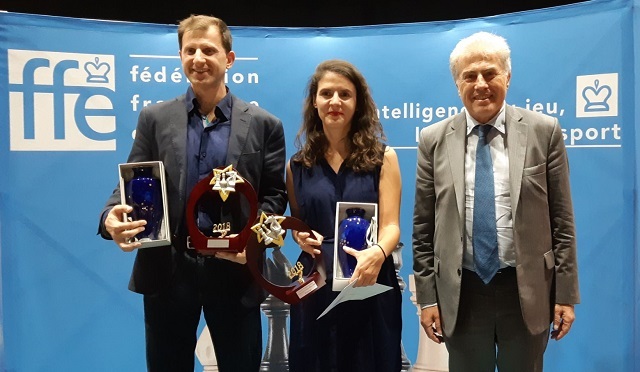 The French champions Tigran Gharamian and Pauline Guichard with the President of the French Chess Federation Bachar Kouatly. Complicated scenario as three players were tied for the lead. Yannick Gozzoli quickly made a draw against Matthieu Cornette who, dispite having the white pieces was happy to finish it his bad tournament. It was the same story for Romain Edouard. Christian Bauer with the white pieces did not risk to lose and quickly accepted the draw. without any risk. Etienne offered draw, which was accepted. A wise choice, because Tigran was absolutely not sure to win. He kept his energy for the incoming tie-breaker. Finally, the only victory of the day is that of Laurent Fressinet against Jean-Pierre Le Roux. Jean-Pierre probably tired of his tournament, locked his queen and had to concede a pawn and then the game. 18.dxc5 instead of 18.d5? would have allowed him to maintain a good position. Sébastien Mazé reached a queen+knight versus queen+bishop endgame against Quentin Loiseau. He tried different things but the draw was a logical result. So we had tie-breaker games. Each player had to meet with white and black at the time control of 5 minutes + 3 seconds per move. Meaning that Romain and Tigran had to play a new match at the time control of 3 minutes + 2 seconds per move. In the first game, Romain Edouard managed to win with the black pieces! But Tigran Gharamian also won with the blacks pieces in the second game ! After this draw 1-1 and like last year, there was the famous Armageddon. The player with white must absolutely win and this time at the time control of 6 minutes for white against 5 for black, without increment! Tigran Ghamarian played with white and managed to keep an advantage of a minute on the clock almost all of the game. He also won on the chessboard. Congratulations to him for his first title of France chess champion! Everything was relatively simple. If Pauline Guichard won, she became champion of France France. That’s what she managed to do thanks to a very nice technical part against her opponent of the day Natasha Benmesbah! A first title well-deserved for Pauline who perfectly controlled his tournament. Sophie Milliet meanwhile, had to win and hope for a misstep from Pauline Guichard. Nothing happened as planned. Maria Leconte, her opponent of the day played very solid and forced the exchange of many pieces. Sophie tried a little in the queen’s endgame but quickly could not prevent the white queen from entering her position to give a perpetual check. So that is a little disappointment for Sophie Milliet who hoped to win his seventh championship in France. She is still in second place. Cécile Haussernot had to win to finish 3rd. Facing Andreea Bollengier, she launched like usual a terrible attack on her opponent’s king and won brilliantly! The battle for the fifth place – qualifying for 2019 – was won by Andreea Navrotescu against Anda Safranska. In the opening, she manages to seize space in the center and to isolate a white knight. Subsequently, there were unexpected moves during the zeitnot, and eventually this knight find a secret passage and escape to the d8 square! But curiously Anda decided to backtrack, while 39.Nf7! looked excellent, and again the knight was back to its original (and bad) place. The ensuing endgame became a bit favorable to black who took over the initiative. The white knight never played again and after some hesitation, Andreea managed to capture the pieces of her opponent. The game between Cyrielle Monpeurt and Anaelle Afraoui ended in the draw, in a rook endgame, four pawns against three on the same wing. With a win, Romain Edouard joins the two players int the lead, Tigran Gharamian and Yannick Gozzoli who made played each other today and made a draw. The 3 players have 5.5 points out of 8. Tigran Gharamian sacrificed a pawn to limit the activity of Yannick Gozzoli’s pieces and the game ended in a draw shortly after that. 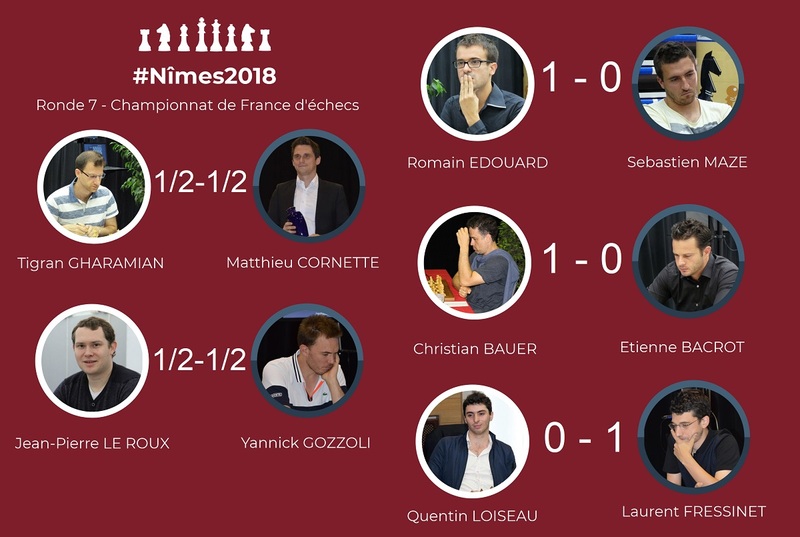 After an interesting tactical struggle, Romain Edouard obtained four pawns for one piece and a presumably winning position against Quentin Loiseau, which he concretized after long maneuvers. Etienne Bacrot showed once again his excellent technique by winning an endgmae in which he had at the start only a very slight initiative against Jean-Pierre le Roux. 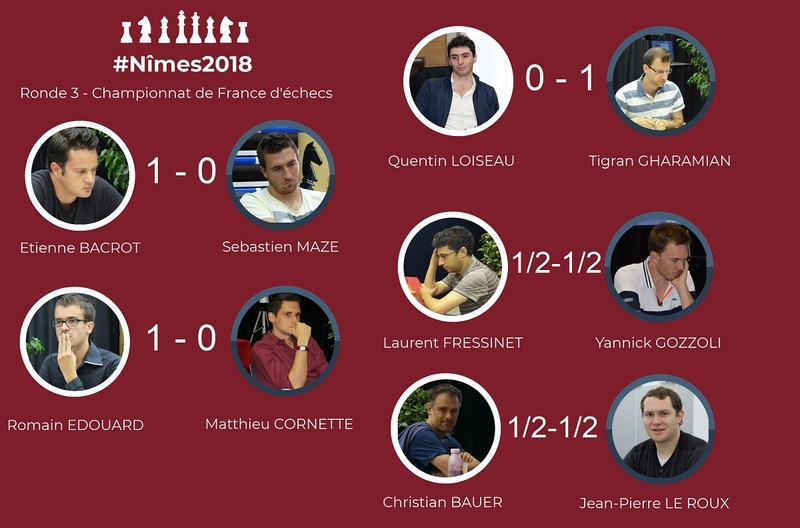 Laurent Fressinet sacrificed a pawn for a very strong initiative, but Christian Bauer was able to defend himself and he even had some chances of winning at the end of the game. A draw without any real suspense has concluded the game between Sébastien Mazé and Matthieu Cornette. Pauline Guichard won the crucial duel against Sophie Milliet and leads by half a point with 6.5 out of 8. Sophie tried to get rid of a positional pressure by playing 21.b4? and the complications which resulted from this move were to the advantage of Pauline. Andreea Bollengier got an advantage in the opening thanks to a better pawn structure, but she could not win against Maria Leconte when the game opened. 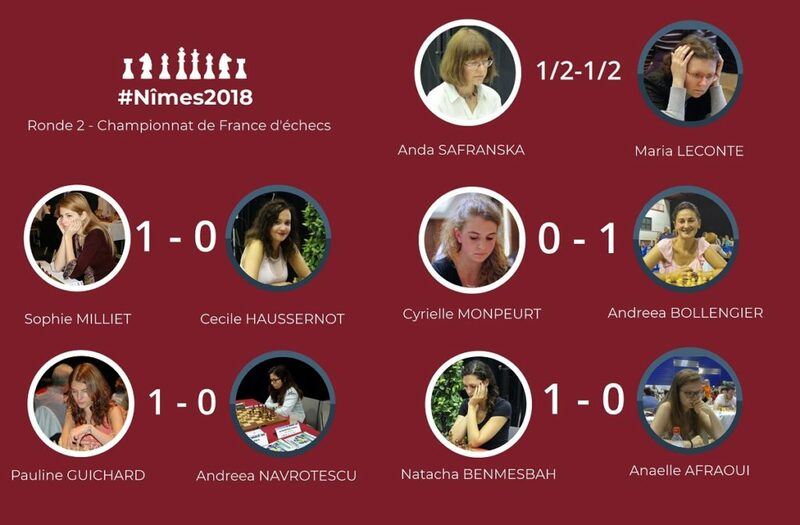 Cécile Haussernot took the initiative for a long time thanks to an interesting pawn sacrifice and she won against Andreea-Cristiana Navrotescu. 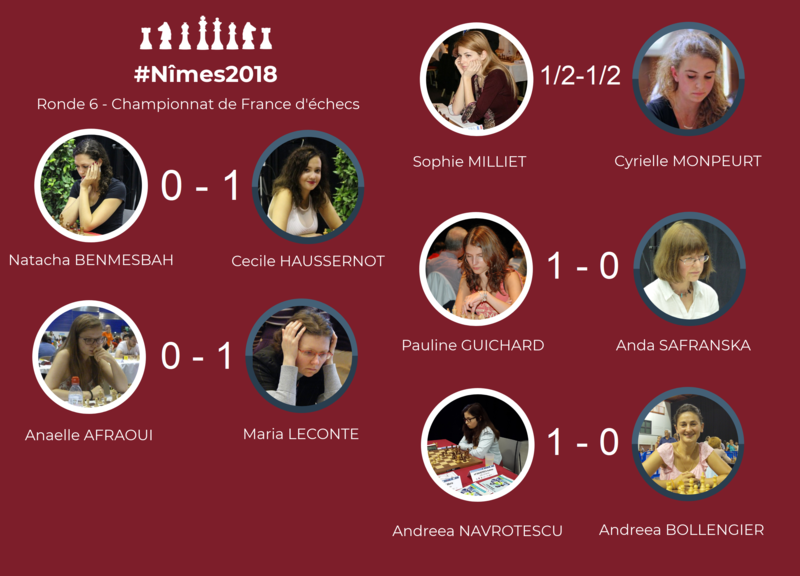 Cyrielle Monpeurt came out of the opening with a promising position and sacrificed a pawn, but Natacha Benmesbah defended well and took advantage of her material advantage. Many moves in a modern defense put Anda Safranska in a delicate position, but Anaelle Afraoui was lost in the complications and had to resign. Today the two leaders made a draw. It was rather quiet and quick for Yannick Gozzoli against Jean-Pierre Le Roux. Tigran Gharamian had a good advantage against Matthieu Cornette. Strangly, just before the end of the zeitnot, he refrained from playing the excellent g4 to fix the backward pawn of his opponent. He had to blame himself because after 40 … f5! he had no advantage and decided to offer a draw. First victory for Laurent Fressinet against Quentin Loiseau. In a Spanish game that quickly turned into an East Indian defense, at least for the pawn structure, Laurent managed to win a pawn. Yet the gain was not obvious, because already many pawns had been exchanged. Quentin picked the wrong direction with his king and played the imprudent 46.Kd3 which allowed 46 … Rf3 +! Then the magnificent 50 … Rf6! forcing the promotion of the black passed pawn. The endgame queen+bishop against rook+knight+2 panws was easily won. Important victory also for Romain Edouard who showed a great mastery in his game against Sébastien Mazé. He sacrificed a pawn in the opening but black declined it. this allowed Romain to gradually increase the pressure until he locked up all the pieces of his opponent. Trying to escape, Sebastien sacrificed a rook, but it was hopeless. The endgame with an extra exchange was winning. By winning today, Romain reaches the third position, just behind the two leaders who will face each other tomorrow! Indeed, we had a little surprise with the defeat of defending champion Etienne Bacrot against Christian Bauer. 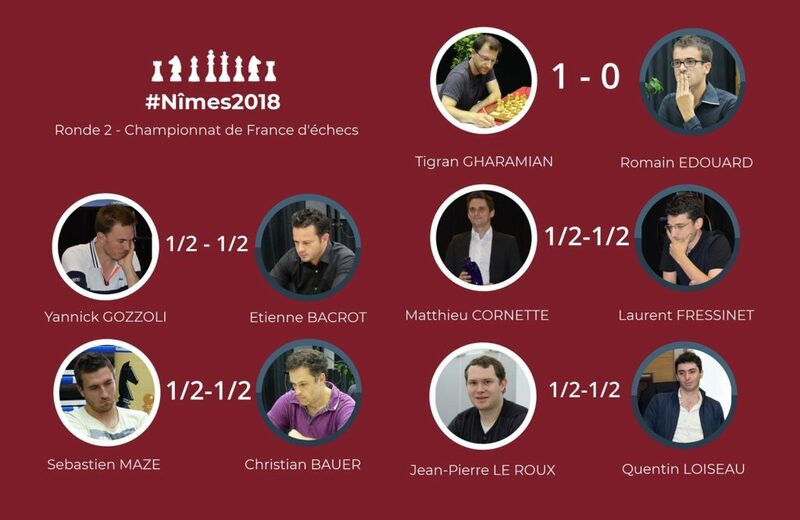 His last game lost in the French championship was in 2014 against Tigran Gharamian! Nice revenge for Christian who has been unsuccessful in this tournament. There were 5 decisive results. 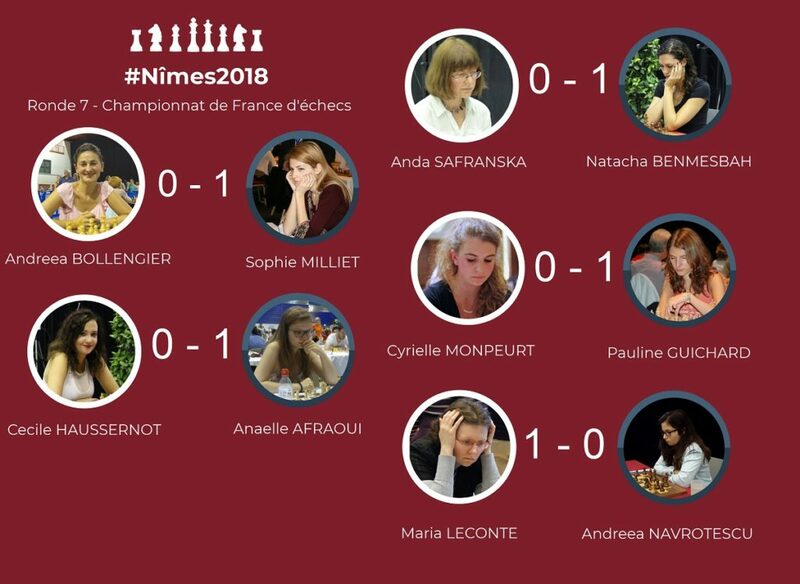 The brave Anaëlle Afraoui finally scored for the first time this year against the 2017 vice-champion Cécile Haussernot who, as usual, wanted to attack the opposing king. This time the sacrifice 22.Nxf7? was really not ok.
Anda Safranska thought she probably won a pawn, against Natasha Benmesbah, sacrificing by 10.Nxe5 ?? but she forgot that her queen was not protected and instead lost a piece. We feel the fatigue of the end of the tournament. Excellent day for Maria Leconte who gets her third victory in a row, today against Andreea Navrotescu. She was still very successful because her opponent, probably tired of the very longgame of the day before, nearly seven hours of play and 178 moves, missed two huge opportunities. Indeed, the simple move 32 … Qf5! allowed black to gain a decisive advantage. Instead, there were 32 … Re4? and after 33.Qd3 ?, 32.Qd5 had to be played, she missed the pretty 33 … Rxf2! winning a rook. Maria goes back to third place. Pauline Guichard did not shake today against Cyrielle Monpeurt. She knew how to use her best pawn structure and open the lines at the right time to win. It was even easier for Sophie Millier against Andrea Bollengier. Andrea, too, did not recover from her seven hours of play the night before. She misplayed her opening and Sophie had only to pick up the unprotected material. 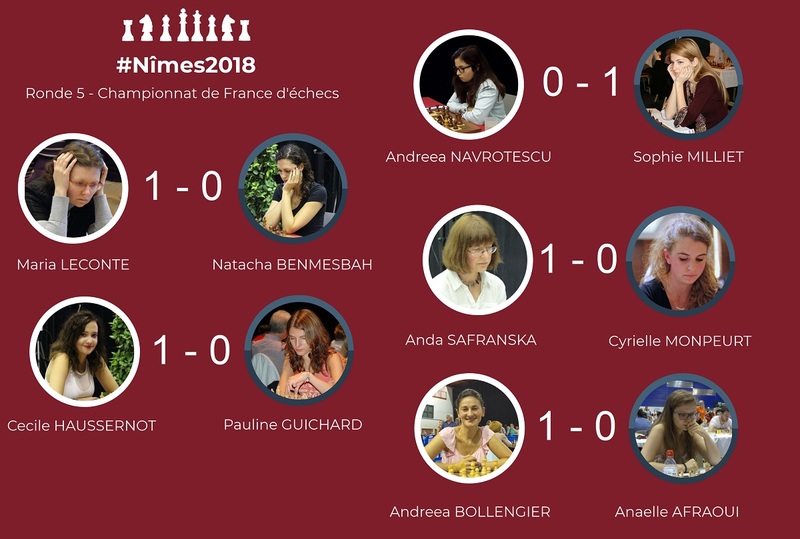 Tomorrow, a probably decisive game will be played between Sophie Milliet and Pauline Guichard. If Sophie wins, she will be crowned champion of France for the seventh time! 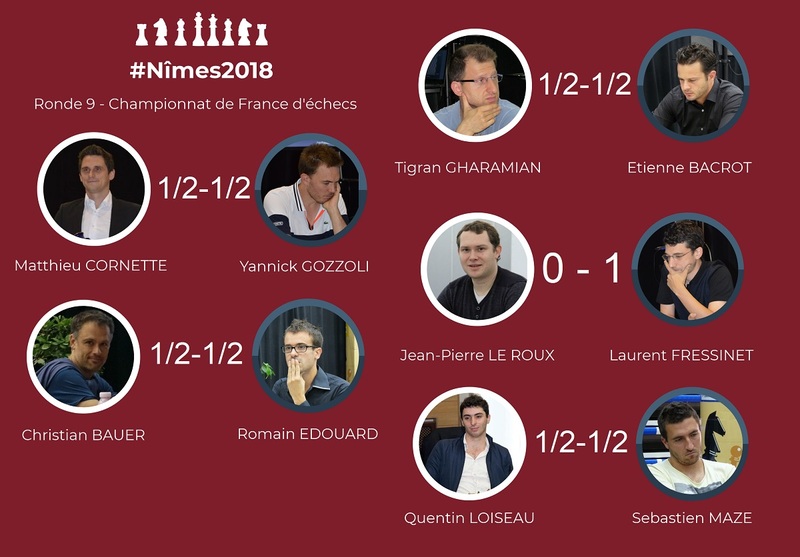 By winning their games, Tigran Gharamian and Yannick Gozzoli are still leading in the French Chess championship with 4.5 points out of 6, followed by Etienne Bacrot (4 points). Matthieu Cornette dominated Jean-Pierre Le Roux before being tempted by a wrong combination: 35.d6 would have been refuted by 35 … c3 36.d7 Rd8! (36 … Ra8? 37.Ke2) and black wins. 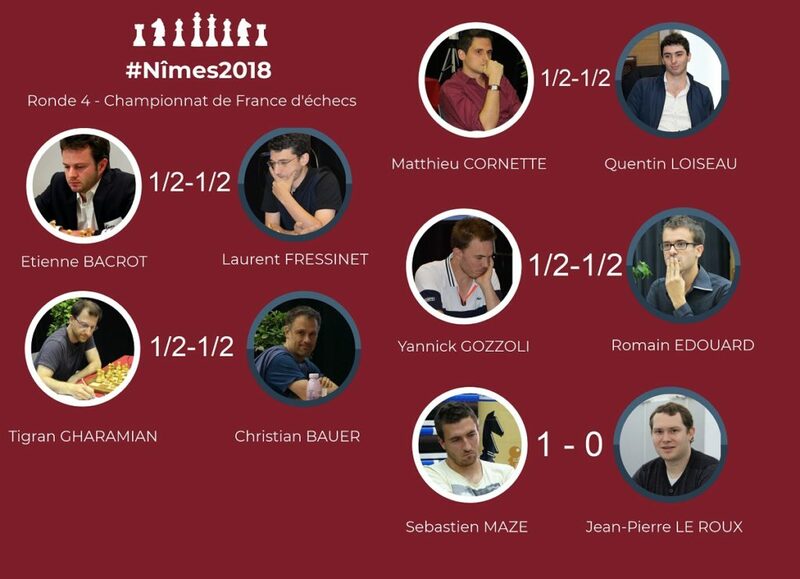 Laurent Fressinet sacrificed a pawn in the opening against Romain Edouard, but obtained in exchange only what was necessary to make a draw. Sébastien Mazé did not obtain sufficient compensation for his pawn sacrifice and was exposed to a violent counter-attack by Tigran Gharamian. 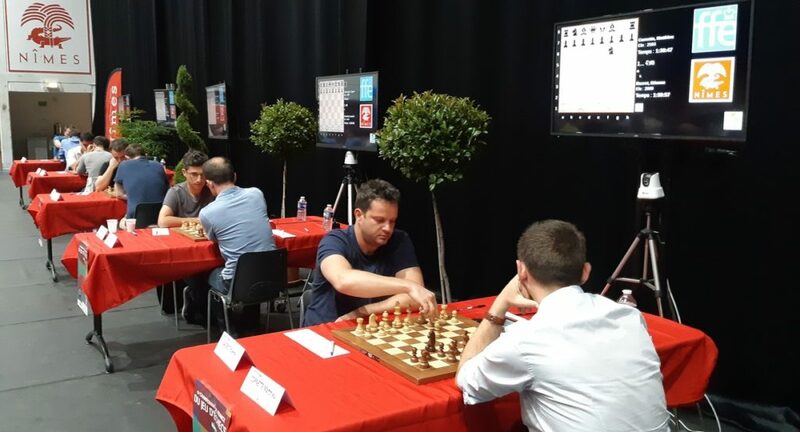 Etienne Bacrot won an excellent strategic game against Quentin Loiseau by putting pressure on the various weaknesses. After an unsual opening, Christian Bauer won a pawn, but eventually found himself in trouble in the endgame with a material advantage, his pawns being blocked. Yannick Gozzoli was precise in the technical realization. 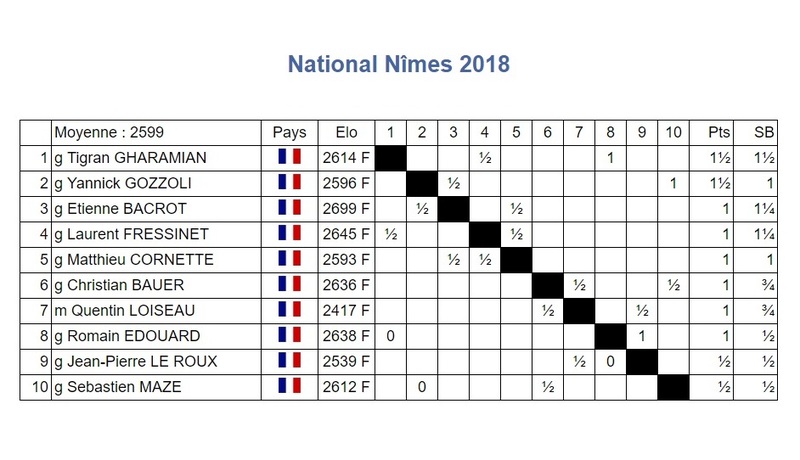 Sophie Milliet made a draw and onyl has half a point more than Pauline Guichard. 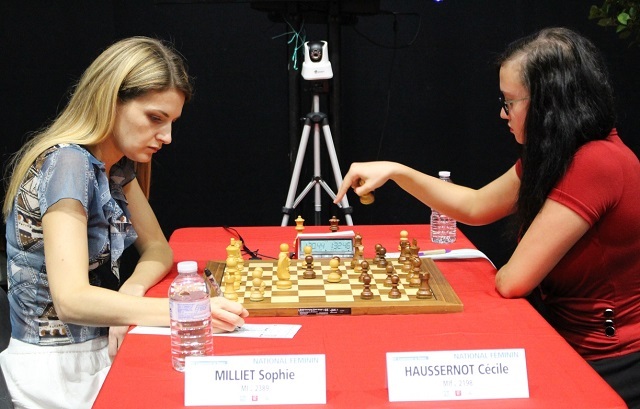 Sophie Milliet took a decisive advantage in the complications against Cyrielle Monpeurt, but finally had to concede a perpetual check. Pauline Guichard obtained a slight and stable edge when reaching the endgame, thanks to a better pawn structure, but she won after an uncertain tactical fight in the endgame, Anda Safranska’s bishop pair remaining active. 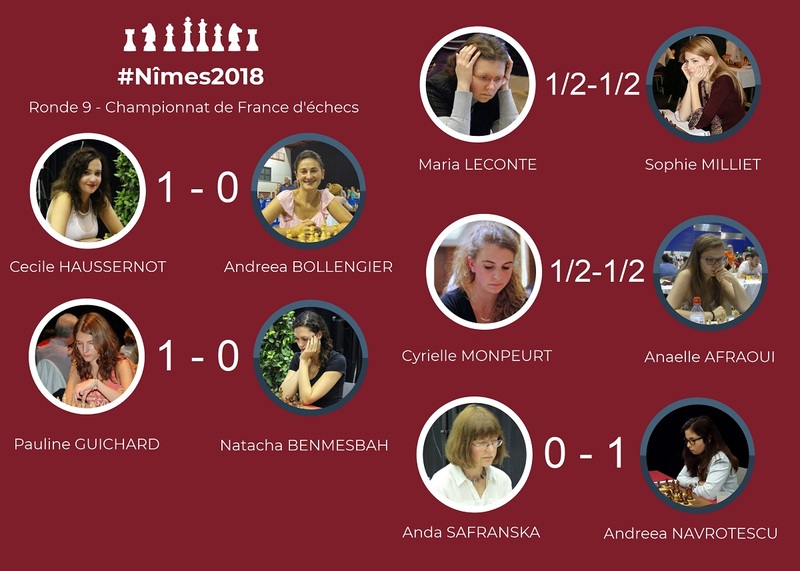 After a bad opening Natacha Benmesbah was a pawn down and Cécile Haussernot, who was not tempted by a technical path, won in her usual tactical style. In a nervous modern Benoni, Andreea Bollengier got a promising position by placing her knight on d4, then the position was more balanced and Andreea-Cristiana Navrotescu won at the end of a very, very long endgame. Maria Leconte made a great come-back in a game that started badly, and Anaelle Afraoui has not yet managed to stop her losing streak which should be psychologically tough to handle. There was only one victory today. Small disappointment for Laurent Fressinet who never seemed to be able to take the advantage against Sébastien Mazé. He had to resolve to trade all the pieces and the peaceful endgame that followed ended logically in a draw. Nice piece sacrifice from Tigran Gharamian against Jean-Pierre Le Roux. Otherwise, his position would have been very unpleasant. It leaded to an endgame rook against bishop + two pawns which was equal. Interesting fight between Christian Bauer and Matthieu Cornette. Christian seemed to have obtained an excellent position. There was the amazing 24.Bxf6 !? and the also amazing 24 … Qxf6 ?! White’s attack quickly emerged and instead of 29.Bxe4, 29.Nf5! would certainly have allowed to win. The endgame queen and bishop against two rooks and opposite colored bishops seemed equal but the two rooks looked potentially more dangerous than the queen. Matthieu wisely took the draw. Here is the beautiful game of the new co-leader Yannick Gozzoli. He catches up Tigran Gharamian with this victory. Two players remain in ambush half a point behind, the reigning champion Etienne Bacrot and Romain Edouard. Today we have only had decisive games. Poor Anaelle Afraoui… she continues her difficult learning of the high level. Yet she had a good position against Andrea Bollengier. She risked a bad combination with 26 … c2? while 26.Ba6 guaranteed her a good advantage. Cyrielle Monpeurt resisted well against Anda Safranska, despite his poorly engaged middlegame. But fatigue, certainly, made her play 50 … Qd7? allowing her opponent to win an exchange. Maria Leconte played a good technical game against Natasha Benmesbah. She managed to fructify her small advantage obtained in the endgame with her majority of pawns on the queen-side. Cécile Haussernot is back after yesterday’s overconfidence by playing an excellent tactical game against the co-leader Pauline Guichard. She performs a nice endgame mat with a queen sacrifice! Had she nevertheless seen how to win on 43 … g6 + instead of 43 … Rg8? The computer revealed it to us: 44.fxg6 Rc5 + 45.Bd5!! the move that we had missed during the live comments, 45 … Rxd5 + 46.Kh6 Qe3 + 47.Rf4 and thanks to the deviation of the black rook, white has an unstoppable mate threat! 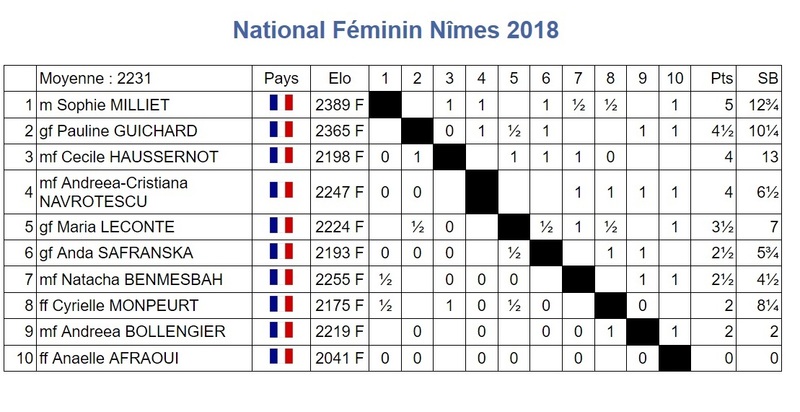 Thanks to her victory today against Andreea Navrotescu, the reigning French champion, Sophie Milliet, takes the lead with one point. A good game for Sophie, where she played on the weak squares of her opponent and entered into Andreea’s position to lead an unstoppable attack. Pauline Guichard is second, while Cécile Haussernot and Andreea Navrotescu are just behind. 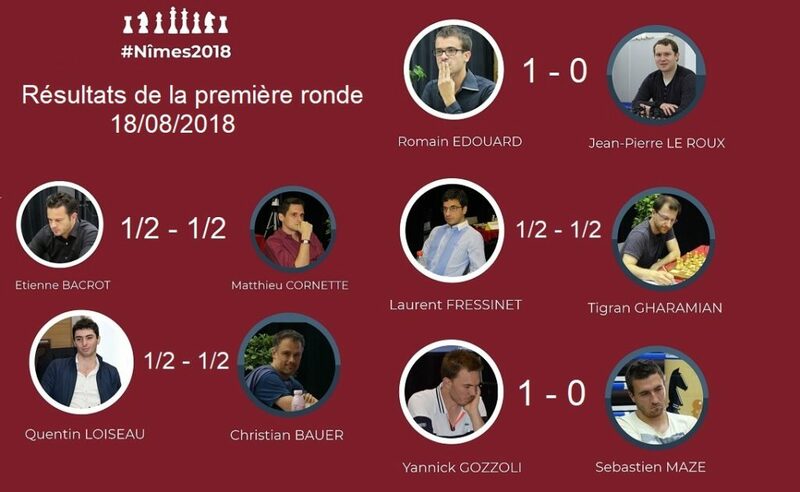 Sébastien Mazé is the only one who won a game today and Tigran Gharamian remains the sole leader with 3 points out of 4. Etienne Bacrot has obtained a significant initiative, but without being able to penetrate Laurent Fressinet’s defense. 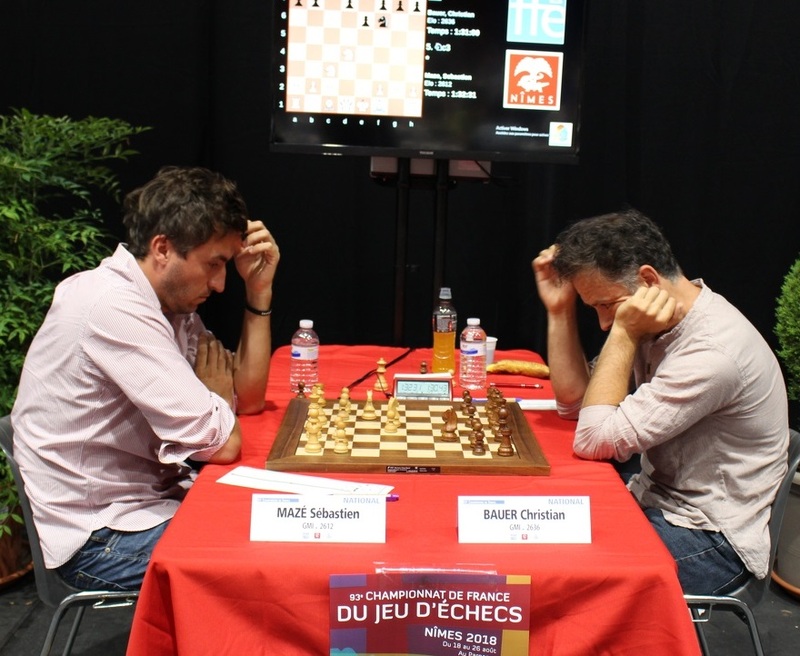 Sébastien Mazé won a pawn against Jean-Pierre Leroux in a tactical skirmish thanks to 18.Bxh6! and won the game a little later. The draw between Yannick Gozzoli and Romain Edouard was expected. The fight between Tigran Gharamian and Christian Bauer was short but fierce and Christian managed to find some initiative in a tight position by the pawn sacrifice 17 … b5 !. Matthieu Cornette initiated a nice combination against Quentin Loiseau by 27.Bxg7! but failed to make win dispite an extra pawn in the endgame. Sophie Millet has joined Pauline Guichard in the lead with 3.5 points out of 4. 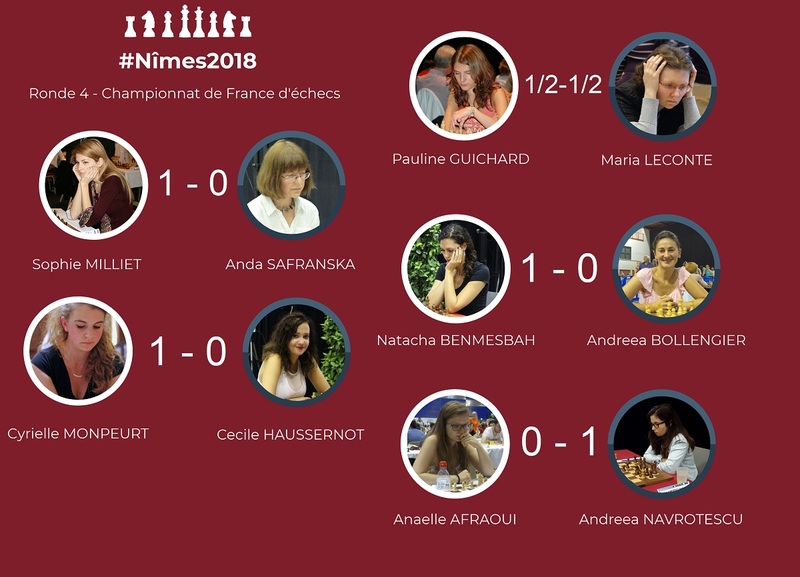 Anaelle Afraoui chose a risky plan by long-castling and Andreea-Cristiana won by attacking the king after many vicissitudes. Pauline Guichard and Maria Leconte played a fierce game. 43 … axb5? could have been punished by the sophisticated maneuver 46.Nd7 (to go to c5) Rc8 47.Rxc8 Nxc8 48.Nc5 Nd6 49.Nxb7! Nxb7 50.a6 and the pawn queens. After being lost for a long time against Cyrielle Monpeurt, Cécile Haussernot pushed to much to win the game, and this time it did not work out. A good defense allowed Andreea Bollengier to solve her problems against Natacha Benmesbah until 39 … d4? refuted by 40.c6 ! Sophie Milliet played hard for the initiative and it ended up paying, but the game was complicated. We saw beautiful fights today. The only quick draw was the game between Laurent Fressinet and Yannick Gozzoli. Despite his extra pawn, Laurent could hardly afford to avoid the repetition of moves. The second draw of this round was also the fiercer, between Christian Bauer and Jean-Pierre Leroux. Christian took an edge after the opening and even got a winning position. 23.Ne3! would have allowed him to conclude quickly. Instead, the game ran into an endgame and we thought that the draw would be quickly concluded. But Jean-Pierre who, thanks to a more active king, managed to reach an endgame with two knights against bishop and knight to create huge problems to his opponent! He probably even got a winning position if instead of 58 … g5 he had played 58 … Nxh5! with the incredible idea of ​​locking up the knight after 59.Nxh5 Kg5 !! Instead, there pawn race ended in a draw. In the game between Quentin Loiseau and Tigran Gharamian, we got the solid Berlin defence but instead of the usual 6.Bxc6 there was the rare 6.dxe5 !? and the game took a more complicated turn. Tigran accepted the pawn sacrifice of his opponent and managed to keep it until the endgame. His perfect technique allows him to take the lead of the tournament with 2.5 out of 3. The reigning French champion Etienne Bacrot gets his first victory, a little earlier than last year. In this Sicilian, Etienne played the fashionable 7.Qf3, an black was very quickly in trouble. The famous exchange sacrifice 28.Rxd5! ended the game. 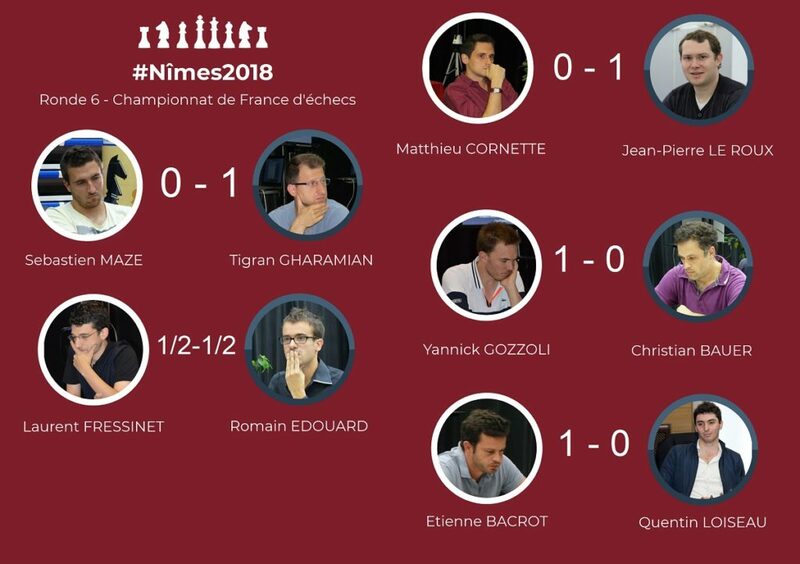 The analyzed game of the day is that won by Romain Edouard who played a surprising opening and get a nice attack against Matthieu Cornette. Three players are half a point behind the leader Tigran Gharamian. Maria Leconte, against Cyrielle Monpeurt, did not manage to breach black’s position. Yet 32.fxg7 would have allowed her to open a breach. Note the unusual 7.exf3 !? 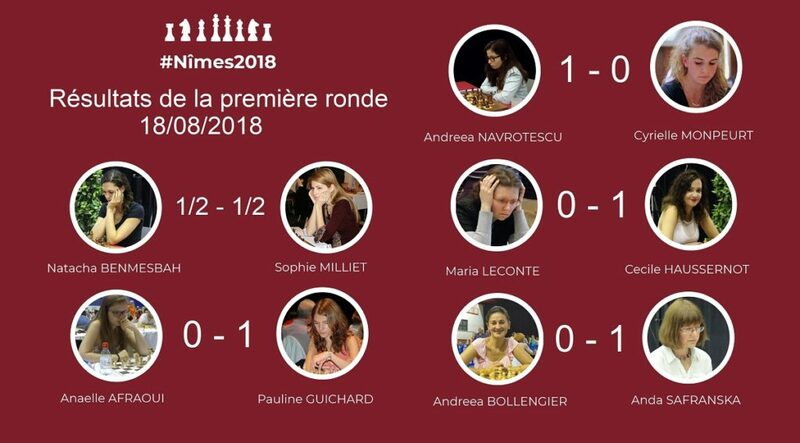 Astonishing was the endgame between Andreea Bollengier and Pauline Guichard. Pauline, despite a very poor pawn structure, came through a series of forced (or forcing) moves to completely block her opponent’s bishop. She remains the sole leader with 3 out of 3. Some luck today for the defending champion Sophie Milliet. 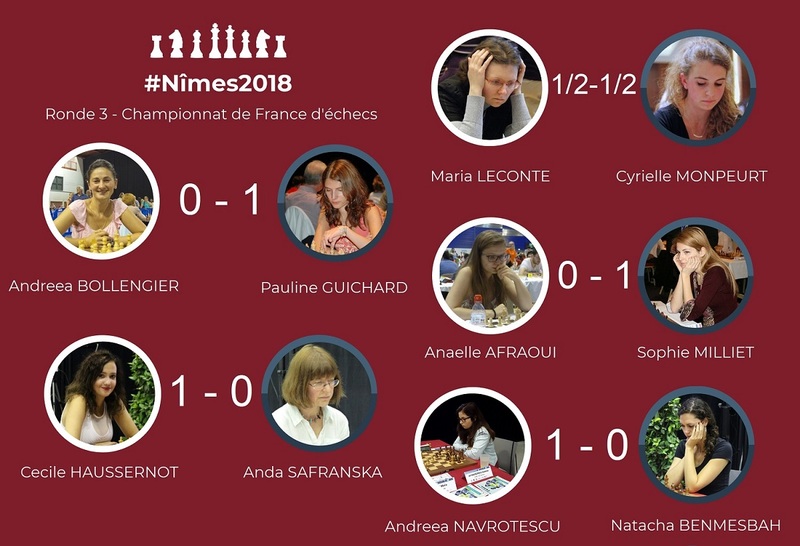 Two pawns down against Anaelle Afraoui, she managed to win a rook, generously offered by her opponent … She remains second half-a-half behind Pauline Guichard. Nice attack from Cécile Haussernot against Anda Safranska. She never released the pressure and ended up cracking her opponent to win a nice endgame. A lot of tension in the game between Andrea Navrotescu and Natasha Benmesbah. The reciprocal zeitnot finally gave the advantage to Andreea who ended up winning a piece. She ties for third with Cécile Haussernot with 2 points out of 3. Tigran Gharamian and Yannick Gozzoli lead with 1.5 points each. 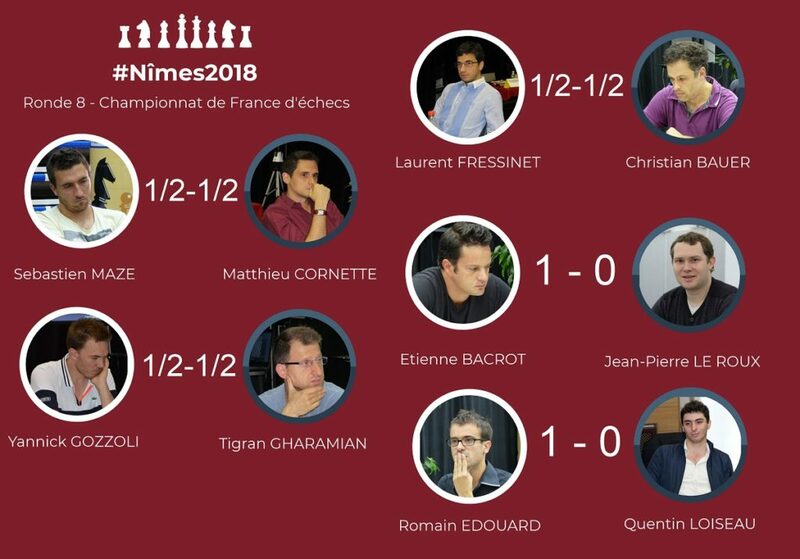 The game between Yannick Gozzoli and Etienne Bacrot ended in an calm draw after a long series of theoretical moves. A very intense closed Sicilian took place between Jean-Pierre Le Roux and Quentin Loiseau in which Black did well in a difficult position. Note that 27 … Re8?, intending to prevent a thematic sacrifice in e6, allowed another one, much rarer, in g6 and white could have won by playing 28.Nxg6! hxg6 (28 … fxg6 29.f7+) 29.Qh4. 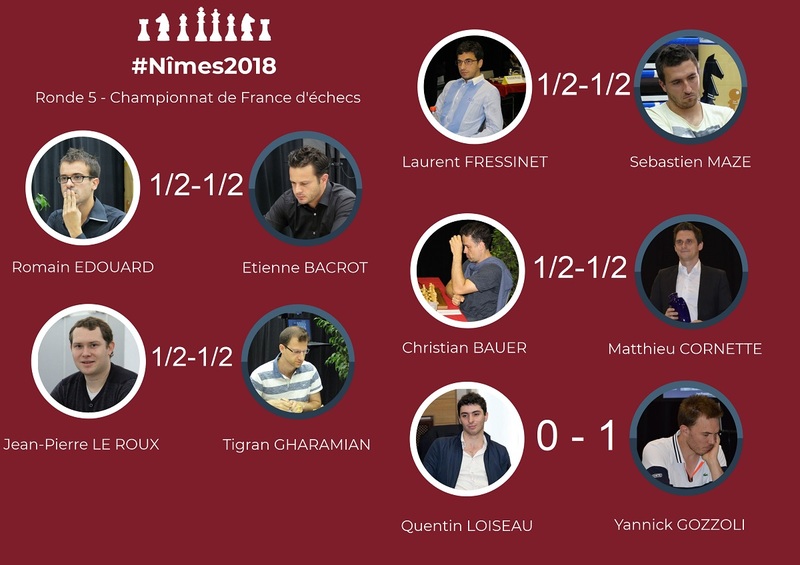 Romain Edouard sacrificed a pawn in the opening for the bishop pair but could not succeed in using it and Tigran Gharamian won with excellent technique. After a typical game of maneuvers of a Spanish, Matthieu Cornette and Laurent Fressinet made a draw. Sébastien Mazé was incisive in the opening and took the lead, but Christian Bauer defended well and eventually took an advantage. But he only get a draw because of a severe time trouble. Round 2 was eventful! Pauline Guichard takes the lead of the tournament with 2 points. Natacha Benmesbah initiated a game on dark squares in the opening by 8.Bxc6 and won on this same color a complicated finale. Nevertheless, Anaëlle Afraoui played well and lost at the very end of the game. In a modern defense, Cyrielle Monpeurt was a bit too optimistic playing 7.e5 and Andreea Bollengier initiated a nice sequence by 7 … dxe5 which allowed her to destroy the white center and take the lead. Cécile Haussernot has invited a clear deterioration of its king side pawn structure. It was a decent decision, but when the game settled its position became bad and Sophie Milliet showed a good technique and won. Maria Leconte looked for an imbalanced position by opting for opposite side castling against Anda Safranska, but this finally led to a rather calm draw. Pauline Guichard then refuted 26 … Qd2 , the decisive mistake, by 27.Nc4. This 93rd French Championship starts well, with many long and unpredictable fights. Shortly before 10pm, there were still five games to play! There were three draws: the fastest is between the eight-time French champion and defending champion Etienne Bacrot, against Matthieu Cornette, winner in 2016. The nice and unexpected 12 … Bxf3 allowed Matthieu to get some activity. The pawn sacrifice 25 … b5! ensured him at least equality. Disappointment for Laurent Fressinet who did not manage to conclude in his engame against Tigran Gharamian. 38.Nxe4 seemed totally logical, yet 38.Rh6! was winning on the spot! Christian Bauer also missed a great opportunity against Quentin Loiseau after 26.Nxe6 ? ?, 26.Nf3 had to be played, 26 … Bxe6 won immediately. But why did Quentin, in the middle game, did not play 15.g3 followed by 16.h4? His position was excellent. Very convincing game by Romain Edouard who will concretize perfectly his extra pawn after 14 … b5 by Jean-Pierre Leroux. 14 … c5 seemed better. The only draw goes to Natacha Benmesbah who made a solid game against the defending champion Sophie Milliet. Maybe 12 … g5 was not a good idea, 12 … Kh7 followed by 13 … f5 looked promising. Last year’s National Vice-Champion, Cécile Haussernot, found the inspiration with 18 … Ra7! ?, 18 … Qb7 was good too. Maria Leconte did not expect this temporary kngiht sacrifice. She refused by playing the passive 19.Rfd1 which allowed her opponent to play a game as she likes: with initiative. Andreea Navrotescu got a great advantage after the opening. Sadly 20.Qe1 ?! wasted his position, the simple 20.Bf4 would have allowed her to maintain excellent chances of attack because the Cyrielle Monpeurt’s king was weak. The position was balanced and Andreea took some risks to win. It worked out as 52 … Rf2 + instead of 52 … Bc8? was the good line. 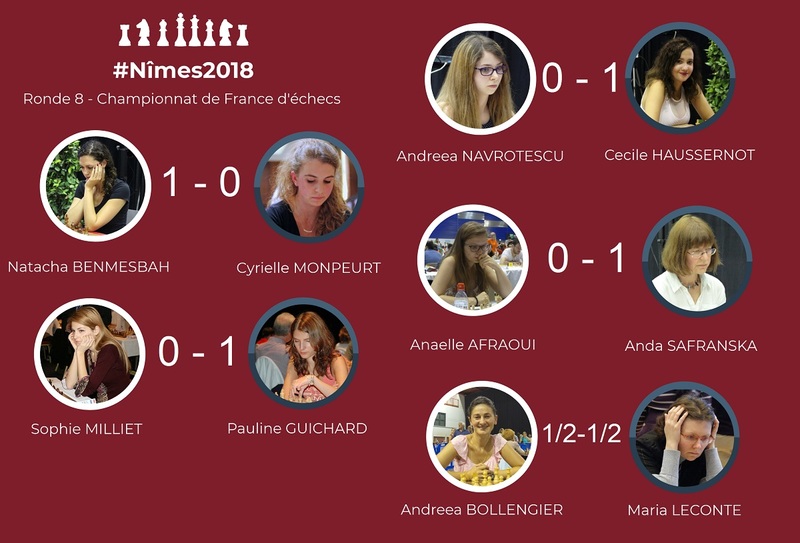 Many mistakes, in the game between Anaelle Afraoui against Pauline Guichard. As always, the one who made the penultimate one won the game! 60 … Rxf3 ?? should have been sanctioned by 61.Kb2! which would have led to the draw. 60 … Kc2 won immediately. Nice perseverance nevertheless from Pauline who played until the end to win. With a surprising opening, Anda Safranska got a good position against Andreea Bollengier. 19 … Rh3! would have been even sharper. In the endgame she managed to grab two pawns but the opposite colored bishops made the victory difficult. Why did not Andreea repeat moves by playing 58.Kb1 instead of 58.Bd5? who loses on the spot? 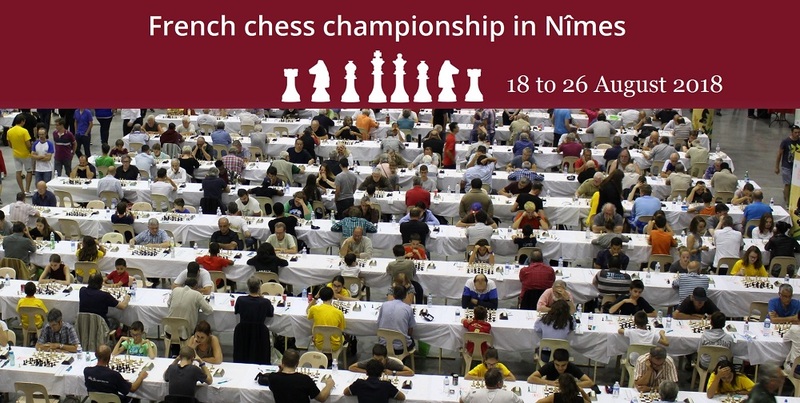 Let’s finish this first daily summary with a picture of the 821 players gathered in Nîmes for this 93rd French Chess championship ! 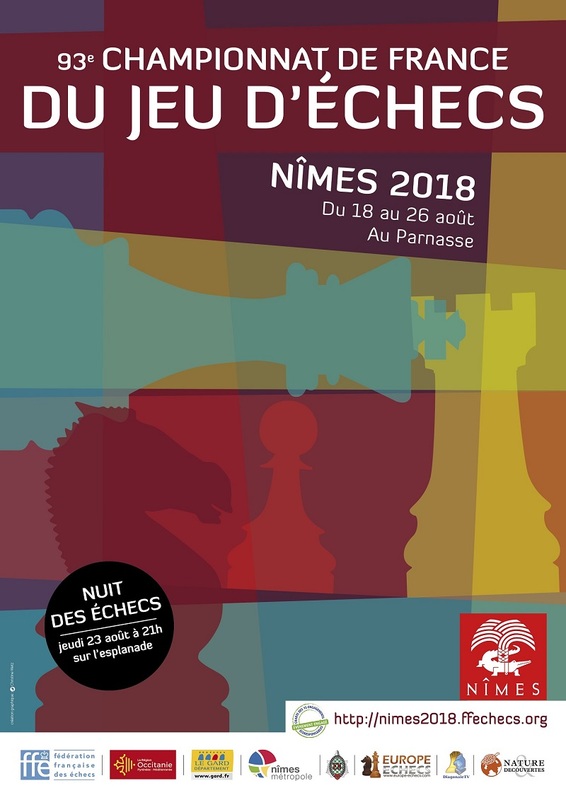 Many animations will be organized in the city, in particular the « Chess night » organized Thursday, August 23rd, and during which it will be possible to play for free against the chess champions in the city center. 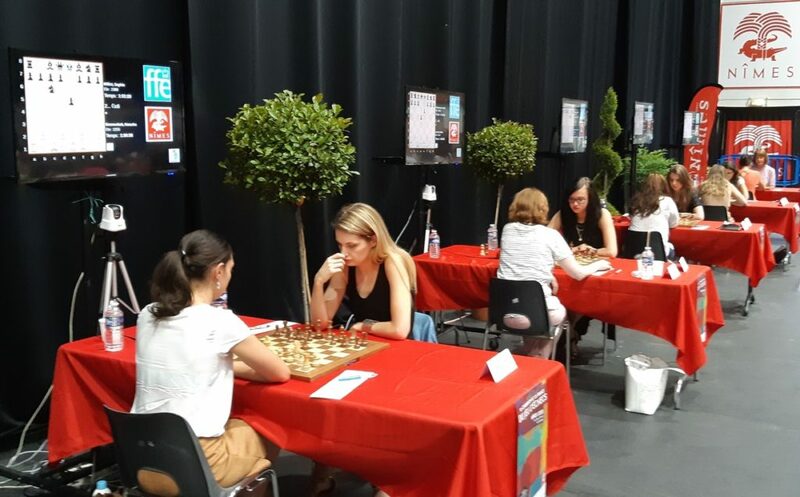 Initiation stands will be deployed to introduce chess to the inhabitants, who will be invited to join the « French Championship of beginners », open to all. 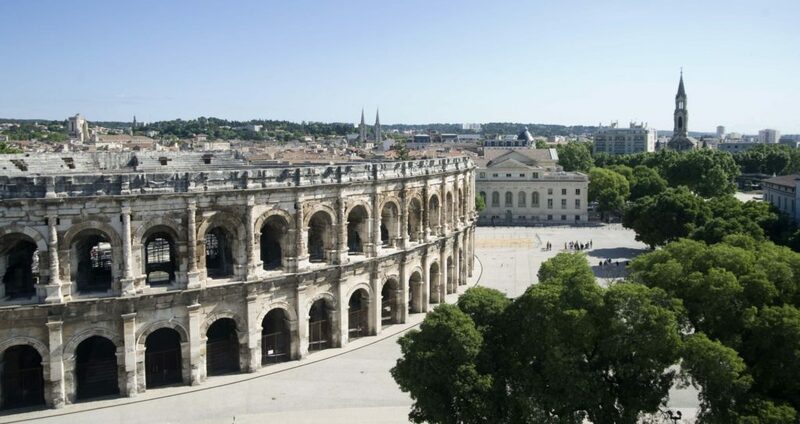 Nîmes has a rich history, dating back to the Roman Empire. Several famous monuments are in Nîmes, such as the Nîmes Arena and the Maison Carrée. Because of this, Nîmes is often referred to as the French Rome.